"High Priestess Creators of fine body modifications since 1996. Come see us at one of our five locations in Oregon - Eugene, Corvallis, Salem, Roseburg. We are committed to meeting the unique and individual needs of each one of our clients. We provide the highest-quality body-modifications available anywhere. We aim to maintain our profitability, our sense of humor, and our moderate growth, while continuing to offer our staff benefits and safe, aesthetically pleasing work environments." Our humble beginnings started as a small basement studio in Eugene, Oregon back in 1996. High Priestess has since grown into a family of full range professional body piercing and tattoo studios. In fact, High Priestess has sister businesses named HTC Body Piercing in Arizona (One location in Tempe, and one location in Phoenix), Barbella Studios in Costa Mesa, California, as well as Ten Tigers in San Francisco, California totaling nine studios, in three states, with over sixty staff members! The combined experience of our body piercers is more than any other studio, anywhere. All nine of our studios offer the highest level of knowledge from counter staff, body piercers, as well as tattoo artists. All of our body piercers are APP certified (Association of Professional Piercers www.safepiercing.org) and knowledgable in the many aspects of body piercing. High Priestess Downtown is a newly remodled studio, offering professional tattooing, as well as professional body piercing, in a clean and safe environment. High Priestess Campus is a fast paced, high end studio, located right off University of Oregon campus. We offer professional tattooing, as well as safe body piercing, with the highest quality body jewelry available. 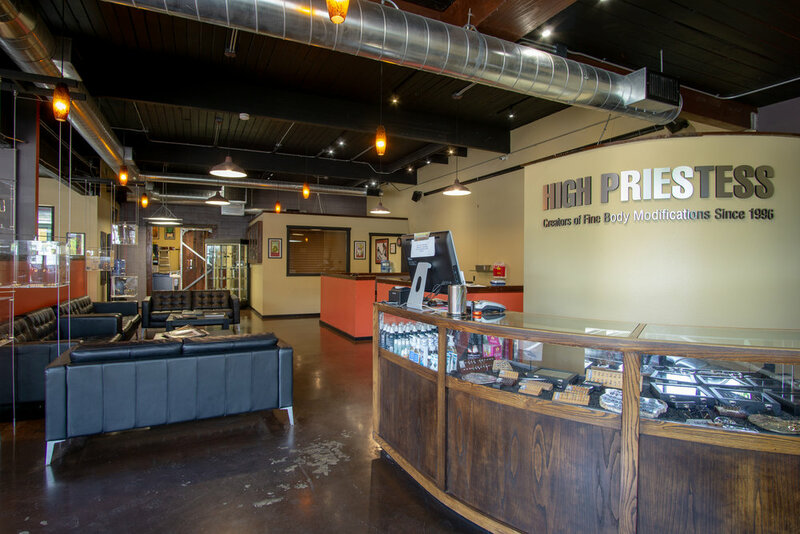 High Priestess Roseburg is the only studio in Roseburg offering body piercers qualified with the Association of Professional Piercers. We are a small, busy studio, that offers safe body piercing, as well as professional tattooing.